Background Information Thomas Jefferson's Koran - William Welty, Ph.D. He demanded use of—and received permission from the Library of Congress to use—Thomas Jefferson’s own personal copy of the Koran on which to swear his oath of allegiance to the Constitution at the inauguration ceremony. Ellison, who was born in Detroit and converted to Islam while in college, said he chose to use Jefferson’s Koran because it showed that “a visionary like Jefferson” believed that wisdom could be gleaned from many sources. 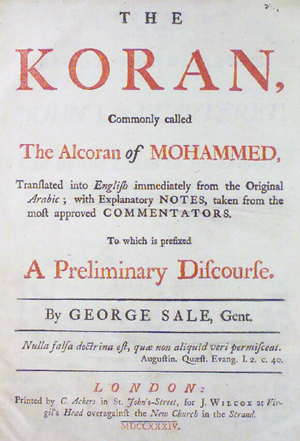 The Library of Congress loaned out Jefferson’s rare copy of the first English language translation of the Koran ever made directly from the Arabic text. It was published in London as a two-volume set in 1764 (see photo, below). Certain individuals complained about Ellison’s choice and quite a stink was raised over the whole incident. Did anybody besides me happen to ask why it was that Jefferson felt the need to own and read a copy of the Koran? I looked for an answer to that question this past week. What I found was absolutely fascinating: Jefferson needed that copy of the Koran because he was desperate to learn something about Islam from that religion’s written de facto standard of all things Muslim. Why? Because the United States was going to war in the early 1800s against conservative, Wahhabi-type, radical Muslims. During the early formative years of the United States, our forefathers fought an international group of terrorists who, like today’s conservative, Wahhabi-type, radical Muslims, made no distinction between geopolitical nation states. They were called the Barbary Pirates. They were from the Barbary Coast of North Africa. Allusion to the affair can be found in the words “…to the shores of Tripoli” mentioned in the Marine Corps Hymn. “Launched in 1797, the USS Constitution (“Old Ironsides”) and her sister ship, the USS Constellation, were built to wage war on the Muslim pirates operating along North Africa’s Barbary coast. It was a wild, untamed region of petty states and warlords whose reach extended deep into the Mediterranean Sea, from Gibraltar to the borders of Egypt. Each owed his allegiance to the Ottoman Sultan, who demanded that payment of an annual tribute be made to his treasury in ex-change for the protection afforded by his Army. It was a tidy arrangement, one that worked well for the Sultan and those who knew their place in the social order. “That the local rulers were obliged to share a portion of their meager income with Constantinople meant that new, more assured opportunities for profit would have to be found. The solution was piracy. “…It was a lucrative business, one that yielded great riches not only for the pirates, but also for the Muslim states that gave them refuge. For many of the rulers, plunder became a mainstay of their survival. In the parlance of our time this was state-sponsored terrorism pure and simple —an extortion racket in which the pirate, the petty states of North Africa and the Ottoman Empire were all complicit. “Not surprisingly, the merchant nations of Europe took a dim view of the Muslim pirates. Even though many had a long tradition of privateering themselves, times were changing, and such practices were now deemed incompatible with a world increasingly dependent on commerce over the high seas. Nowhere was this sentiment expressed more strongly than in America, where a young Congress, flush with a sense of invincibility after the War of Independence, readily took up the challenge. “Having championed the cause of liberty and free trade during years of struggle, members were infuriated that the sovereignty of America’s commercial fleet was not being respected. The Royal Navy no longer patrolled the sea lanes on behalf of the American colonies. United States shipping was now vulnerable as never before; as the cost in lives and property mounted, the government concluded that something had to be done. But what should that something be? “In an effort at peaceful diplomacy, missions were dispatched to the Barbary states of Tripoli, Algiers, Morocco and Tunis with a modest proposal: The U.S. would agree to pay an annual sum to each of the Muslim warlords if they, in turn, would agree to protect American vessels traveling in their waters. “To most of the politicians at the time, this seemed like a perfectly reasonable, if not practical, solution. In the immediate aftermath of the Revolution, the United States had neither the stomach nor the ability to conduct another war, particularly one that would have to be waged so far from American shores. After all, this was the wily Middle East, a region known only to a few intrepid travelers, and plied by adventure-seekers and businessmen for whom kidnapping and ransom was a constant occupational hazard. “Moreover, paying tribute was a time-honored practice shared by both nation states and petty kingdoms alike. A clear, business-like approach that did not require the shed-ding of blood also blended well with the rational sensibilities of the 18th-century mind. “Piracy was presumed to be one of the many risks that attended foreign trade. If one could buy protection, even from the rogues themselves, how was this so different from insuring a ship’s cargo against a natural calamity? So the logic ran: America’s interests could be satisfied, and its honor assuaged, if common ground could be found between the pirates and their victims. “And so it happened that agreements were reached be-tween the United States and rulers of the Barbary Coast. In exchange for cash payments, the rulers pledged to guarantee the safe passage of American ships and to put a stop to the practice of maritime kidnapping. As the 18th-century came to a close, Americans were cautiously optimistic that they had solved the Barbary problem. “By 1801, however, it became clear that the policy of appeasement had failed. The Pasha of Tripoli, who five years earlier had been satisfied with a payment of $56,000, now demanded increasingly larger sums. When they were not forthcoming, piracy resumed. The same held true for the other Barbary states. The Algerians received payments from the U.S. totaling $990,000 plus another $585,000 in 1793 to cover the ransom of 11 American ships. These were extraordinary sums for a nation with a budget of no more than $7 million, but the appetite of the Muslim states seemed to grow evermore insatiable. “As America soon learned, a policy of accommodation only encouraged the brigands of the Barbary Coast to seize more ships and to take more captives. Far from providing safe passage to American and other foreign vessels, the North African rulers remained active accomplices to the crime of piracy, taking protection money while at the same time permitting the banditry to continue. Jefferson also figured that the best way to learn about the political, military, social, economic, and religious agendas of America’s enemies was to read the best textbook on all things Muslim. So he read the Koran in what for his day was a state-of-the-art translation into English directly from the Arabic. Jefferson’s copy of the Koran equipped him with everything he needed to know on how to respond to threats from the caliphates of the early 1800s. Then, in 1805, the Constitution supported the landing of Marines “on the shores of Tripoli” in an action that was subsequently immortalized in the Marine Corps Hymn. The Americans and their allies destroyed the harbor citadel at Derna that served as the headquarters for the pirates. Jefferson’s resolve to fight had its genesis in his reading the Koran as the best source of all things Muslim. Jefferson knew that 18th century Americans were in danger from what we call today conservative, Wahhabi-type, radical Islam. You will keep all of this in mind as you serve as the first Muslim elected to the House of Representatives, won’t you Mr. Ellison? February 2007 Personal Update NewsJournal. Do you know that Islam is the fastest growing religion on the Planet Earth? With their oil revenues and their possession of nuclear weapons, their aggressive agenda cannot be ignored.